There are thousands of yoga devotees in the Boulder and Longmont areas, as we all know. We are lucky to live in a place where people place such an emphasis on their health and well-being. Many options are available to take classes and join studios that specialize in a variety of yoga approaches in our area. Here at Be Well Bodyworks, we are pleased to offer therapeutic yoga, which can tie in nicely with your existing yoga practice. Even if you have never tried yoga, therapeutic yoga can help you address pain and injuries with yoga poses modified to accommodate your specific needs. Yoga poses and isometric exercises can help you regain mobility and flexibility, as well as address pain. It’s a low-impact alternative to other exercise. Especially if you have been injured, or if you are experiencing pain, a high-impact exercise routine might not be the best option for you. It can support better sleep. Yoga is a relaxing and restorative practice that can help you relieve stress and worry and can also prepare you for a better night’s rest. Yoga can help you maintain a healthy weight. Studies have shown that yoga practitioners can prevent weight gain and lose weight with regular yoga practice. It helps ease pain. 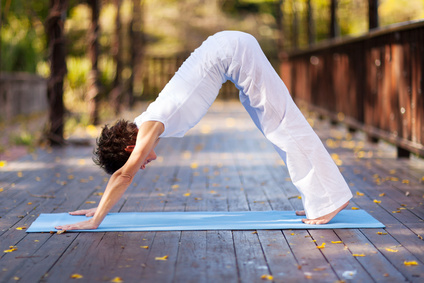 Studies have shown yoga’s impact on neck and back pain by loosening contracted muscles. It boosts brain-power. Focused breathing during yoga encourages increased oxygenation, which can help improve memory and ease symptoms of depression. Yoga is a great addition any healthy lifestyle. It encourages better posture, mindfulness, focused breathing and so much more. To learn how therapeutic yoga can help you address pain and achieve a greater sense of well-being, please contact us.